Eight fantastic students from the 4CITIES masters programme in urban studies performed a classic Copenhagenize Design Co. desire lines analysis on one of the busiest corners in the city, where Søtorvet meets Dronning Louises Bro – the latter being one of the busiest bicycle streets in the world. After so many Desire Lines Analyses in Copenhagen, we know that on average only 7% of Copenhageners bend or break a Danish traffic law on their bicycles. At this location, many cyclists cut the corner across a wide swath of sidewalk. They wanted to analyse their behaviour at this key location. Like in many cities, even bicycle-friendly Copenhagen has had a planning culture that has found other modes of transportation subservient to the private automobile. However, in the past forty years, much has changed: a rich network of bicycle lanes has been constructed that is today mirrored by a 55% bicycle mode share among residents. With such a large number of residents cycling to get around, it is important to better understand the behaviour of cyclists, in order to design and modify the bicycle infrastructure to best accommodate its users. Such logic informs this study, which aims to understand the behaviour of cyclists at a specific intersection in Copenhagen (as shown in the image below). This intersection is at a high-volume location in the city. The bridge is the second-busiest stretch in the city for bicycles, with around 40,000 bicycle trips each day. It is a bottleneck for great number of citizens heading to and from Nørrebro and beyond. 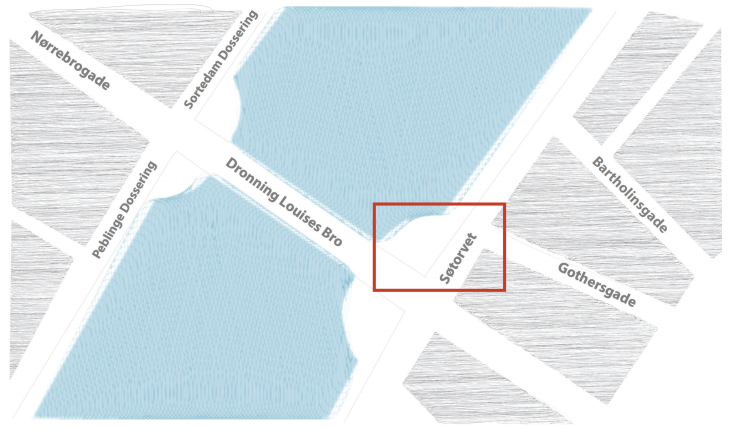 This study was designed to observe and represent the behaviour of cyclists approaching the intersection from the northeast along Søtorvet, and then turning right onto Dronning Louises Bro. Particular focus will be placed in the study on whether cyclists obey the traffic laws on this route, and where this is not the case, what patterns of illegal (i.e. non-conformist) behaviour emerge. This observation took place on Thursday, November 13th between the hours of 07:00 and 19:00. The weather conditions were typically autumnal: around 10⁰c with overcast skies, a moderate breeze and some drizzle. The observations and this report were produced by a team of students completing a master’s degree in urban studies, partly at the University of Copenhagen (www.4cities.eu). 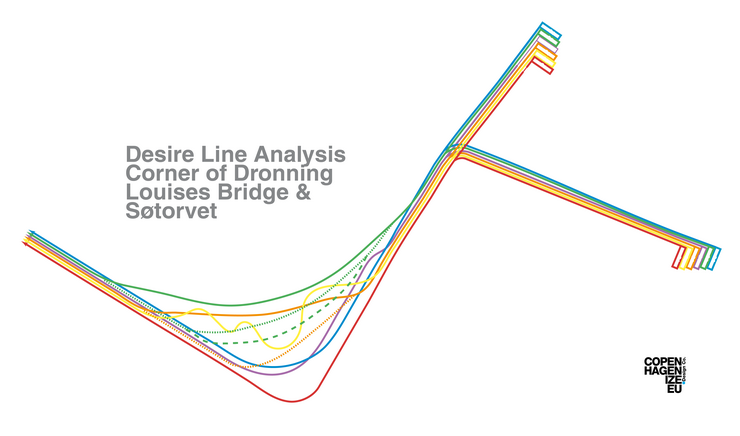 The project was part of the body of work of Copenhagenize Design Company and utilised their Desire Lines Analysis Tool. Copenhagenize provided guidance and material. Read full report and download pdf at copenhagenize.eu. Previous Previous post: How “alternative” are alternative urban policies?